Logbook of a distant observer. On Some Works in Via Satelite. Gilda Mantilla. Ciudad*Postal. Colección en Construcción. Web project. 2004. Natalia Iguíñiz. La Otra. "Detente, Príncipe de las Tijeras, que el manto has olvidado en las cascadas. El arpa con un ojo hacia la estrella como halcon asomado te despide. El violín pasa el arco sobre luna y el chumpi* que sostiene el arpa en cielo lanza el hondazo de diez mil estrellas. Se duermen las tijeras y resuenan los sueños que resuenan en el día"**. These closing words of the video Atipanakuy (1999) by Alvaro Zavala can only lead to a profound perplexity. A perplexity that goes beyond the remoteness of its utterance, further still than the mystery that resounds in them. The perplexity I refer to is concretely related to its location, i.e. placing it just at the close of a piece of video art -a contemporary art work inserted in a highly specialized circuit of production and circulation, built on a language both current and technological. A language more appropriate for immediacy than for history, for immanence rather than for myth or tradition. Which is the standpoint for a contemporary artist, one who makes use of such language, to invoke, then, those verses? Which is the soil, when is the right time and under which circumstance should this dialogue be promoted ­between such sophisticate means and a historical heritage so conclusive in its radicalism? If we move onto the group of works that constitute Vía Satélite we shall realize that the matter is still more complex. It is not only the Andean heritage the one which problematically articulates with the present but also that the multiple contexts and the areas of conflict -­historical as well as political, economic, ethnic, cultural and social- run through this selection of photographic and electronic Peruvian productions recently made. 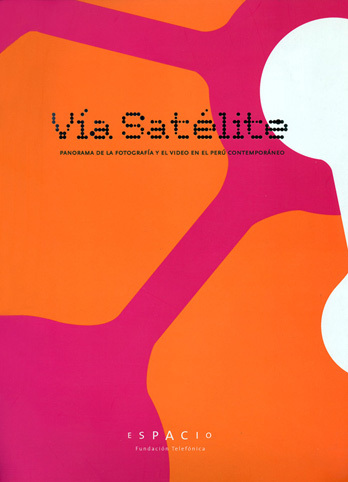 In a certain sense, Vía Satélite is a barometer that expresses certain latent tension in the technological art of that country, and this can be perceived almost on surface. Its operations theater is everyday events, the hubbub of urban life, people rambling around the city and the media iconography that frames their lives, social reality and the political arena. All these references appear once and again, configuring an intricate map of representations and speeches which almost always ends in a resemblance of Peruvian reality followed by a question mark. If there is anything that calls our attention, this is the constant questioning about the cultural identity. It is not a minor subject, though. Even though the research on local identities is a common topic in the artistic production of the 80s -particularly as of the definite settlement of the economic globalization processes worldwide-, the question of the national identity is not, in this artistic production, a nostalgic resource or the excuse to contrast the present with a presumably potent or idealized past. There is no essentialism in this identity quest, and it is not a matter of patching the present cracks resorting to decanted forms of tradition. On the contrary, a cultural identity is essentially understood as a construction on the making, a labor that has its origin in the intricate network of ethnic, historical and cultural matters which constitute a meaningful treasure only for the present. A construction that implies the articulation of dispersed, incongruous fragments which are not the output of a probable primordial unity, but the multiple and unfinished raw material which ensures a configuration that has cultural diversity in mind. This approach is evident in a video like SP Super Peru (2002) by Jorge Luis Chamorro and Carlos Letts. Regardless of the author's intentions or perhaps as an explicit consequence of their deconstructive procedures, the art piece offer us a compendium of Peruvian popular culture in the only way it could be captured without losing its nature: it's contradicting, irreverent and pungent. Defined as a "kind of post modern hymn" (1), its images put together the most disparaging references, attitudes and iconographies: from the forerunning writings by Jose-Carlos Mariategui, to the peddlers in public transport, from the autochthonous fauna or the Andean heritage to a youngster neglectfully urinating in the sidewalk or another one who burns the national flag before the camera. Everything running unceasingly; all of it without any implicit moralistic speech, with no discrimination between good and evil, feeling no guilt, without rebukes, warnings or reprimands. As in other parts of the world, this construction of local identity does not escape the growing commercialization imposed by Neo­-Liberalism, which strongly traversed Latin America in the 90s, last century. If the question of identity appears as a necessary reflection before the globalizing process, the building of stereotypes and market identities is born in the region as its necessary counterpart, in an economic-cultural circuit dominated by a desperate hunt for economic profit. 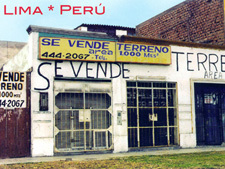 This ground is explored by Beatrice Velarde in her Peruanidad Technicolor (1999), a photographical series. In it, the city is a large setting of places, icons and situations that frames a social reality transformed by the commercial reason. The urban landscape has ceased to be the necessary context for communal life. It is imposed, now, as a sordid show of tourist attractions, dim lights and kind entertainment. As it happens with SP Super Perú. the vision on local identity is deeply ambiguous. If on the one hand, the urban center is presented as a place almost inhuman, full of first-world fantasies and local pretense, on the other. the gravitation of these factors is not ignored, as they are concerned with the conformation of a profile of contemporary Peru. Momentarily leaving moral opinions aside, the spaces portrayed by Velarde are recognizable spots of the local urban experience. In all these pieces a methodology of work can be perceived and this has been described by Hal Foster, the American critic, as the conduct of "the artist as ethnographer”(2). Using The Artist as a Producer (1934), a classic text by Walter Benjamin, as a source, Foster notes that the conditions of the artistic production have changed in the contemporary world. If in the past the artist was defined as a producer of his representations, now he is more devoted to re-­register the established representations. If in the past his practice was defined in terms of economic relations, today, that individual must be understood in terms of cultural identity. His formal universe now is not that of the artistic forms but that of the cultural images. And the artistic practice becomes a heedful and reflexive reading of the social signs, an analytical revision of culture -this understood as a text. Thus, the artist enters the expanded field of culture, which traditionally was the field of anthropology. His task, then, is similar to that of the ethnographer: he collects data from the social framework, he records and analyzes his material, and proposes meanings and readings. Another characteristic, common to a great part of the productions in Vía Satélite, is derived from this kind of work: the use of public space, both as an information source and as inspiration since it is the specific site for the artistic proposal. According to what Jürgen Habermas established (3), the public sphere was historically a space created by the bourgeoisie to exercise their criticism of power. As such, it is strictly differentiated from the private sphere, reserved to domestic life, and the circle of power from which the social regulation is exercised. Control of the ruling class was exercised using the public sphere and through a criticism of those ruling actions considered to be inconvenient; this criticism was enunciated in terms of social opinion. The same space was later occupied by the manifestations of trade unionists and politicians who, even when they had a heterogeneous social composition, followed similar critical purposes. However, during the 90s, there was a generalized world movement towards the deactivation of the public sphere; this was fostered by the Neo-Liberal policies which were propagating to the pace of economic globalization. The disassembling of that space was necessary to produce a substantial modification of the working schemes, a strategy to make workers lose a large part of their conquests in the field of labor obtained along the course of the twentieth century. This meant a new distribution of the economic power, now in the hands of multinational corporations; it also involved the disappearance of local industries and the concentration of capital in the central countries. 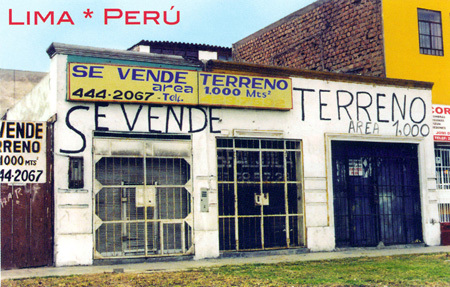 In Peru, the visible face of this process was Alberto Fujimori. The recovery of the common space on the artists' side led to reactivating its critical substratum and, whereas that space became the laboratory for the artist-ethnographer to produce its analysis. Sent into the streets, contemporary creators inserted their practices in an ever growing circuit, one larger than that of the institutions and, in many cases, in an open confrontation with these. Also the common space was the site privileged for the recovery of social history, the meeting point for cultural and ethnic diversity, the examining into short narrations, and the dialogue with life. To the light of all this, one can appreciate Sergio Urday's Proyecto Fotográfico de Retrato Ambulante en Mesa Redonda (2003). Recovering some principles from the photographic portraits of the turn of the nineteenth century -the painted backdrops, labor in open spaces and with natural light, absolute frontal takes, and static postures- ­Urday produces an open mosaic of urban beings, using the complex social framework of Lima. As in the photographs of the nineteenth century -­mainly the anthropological ones- there is also an evident tension between the portrait and the act of typifying it, between the taking of an individuality and its being turned into a stereotype (4), which the artist avoids revealing the device that builds the image. Even in the ironic detail of setting these characters against a rather artificial mountainous landscape, a kind of denaturalized Andean landscape, and one can perceive that intention of avoiding excessive realism in the portraits, a realism that might blur the analytic spirit with which they were taken. For the contemporary artist, the city is an ocean of signs to be explored. But that exploration does not necessarily imply a search for those hidden or less known spots; on many occasions it is the rediscovery of common places. Those simple, everyday sites -which are neither attractive nor dramatic and are usually left aside by the urban cosmetics and the media iconography- are the fertile soil for the present proposals to germinate. Luz María Bedoya literally intervenes among the city cracks. Her delicate act of feeding walls, crevices and fissures with enigmatic messages -meaningless texts created by the author, though based on a correct grammatical syntax- allows her to pull out poetry from the very materiality of the urban entourage. Those messages, stranded, abandoned, condemned to disintegration in the cold ramparts, try alternative ways of circulation, get rid of the stiffness of the text after they free from the grammatical structure. In this sense, the artistic operation explores new ways of communication through the words, ways imbedded in the social context rather than in the media infrastructures. In her Ciudad* Postal. Colección en Construcción (2004), Gilda Mantilla plunges into the significance of the unnoticed city spots. The landscapes and urban images she chooses to produce her postcards are not the typical tourist cards, already part of the imagery present in the mind of the consumers, but those who had been forgotten or ignored because of their being overwhelmingly present. So, the eyes and camera of the artist focus there. In capturing those places one might see an almost "performatic" attitude, a will to accompany with the body that pick out made by the eyes. This "performance" aspect of her proposal is clearly revealed when you consider the final backup for the piece: a website where visitors can generate their own postcards -­taking those views from the spots they feel more attracted to- and then socializing them through the Internet. The images that gradually crop up should not have any special photographic quality. In fact they are, in its vast majority, taken and made by amateurs. They are part of a conceptual proposal in which people's participation and the circulation of the images are beyond any critical search for formal or technical assets. In this sense, they reactivate the roaming on the space photography and its artistic statutes occupy in society. In his essay Señales de Indiferencia: Aspectos de la Fotografía en el Arte Conceptual o Como Arte Conceptual (I995) (5), Jeff Wall establishes the importance of that attitude of "indifference" the conceptual artists showed towards the formal values of photography, when this was introduced in the contemporary art circuit. In the sixties, "Working-class, lower-middle class, suburbanite, and underclass milieux were expertly scoured for the relevant utilitarian images, depictions, figurations, and objects that violated all the criteria of canonical modernist taste, style, and technique", as the Canadian artist puts it (6). The unconcern for the technical demands made photography to acquire its analytical character, thus questioning the formalist inheritance of modernity and taking the decisive step to its being included in the grounds of contemporary aesthetic reflection. In the photographs from Ciudad*Postal. Colección en Construcción, as well as in many of the videos in Vía Satélite, there's evidence of that non-chalance as far as the formal values are concerned -an unconcern which emphasizes the conceptual proposals, gives weight to the critical-political discourse or turns its eyes towards analysis and reflection. Making the "good quality" of an image a relative matter is an attitude also found as a frequent practice in the field of video art: the appropriation of images from the most varied sources, even though television seems to keep on being the privileged alter ego of the electronic artistic production. Angie Bonino bases her piece La Imagen (2001) on this procedure. Using a brief piece of journalistic information, Bonino reflects on the construction of reality by the media. For this purpose, she sets off using an image that resists perception because of its briefness as well as the electronic manipulation it has been subjected to. A set of intermittent light signs name her in different languages, but these are incapable of translating their content. Only by the end, in a swift, fleeting movement, the image becomes corporeal and it's that of a group of public demonstrators resisting an attack from the police force. In Bonino's device one realizes that images cannot only show but also hide. The audiovisual language has some grammatical procedures (takings, montages, camera movements, and etcetera) which are far from being innocuous though frequently try to be transparent. The deconstructive procedure invites us to stop before some events which would otherwise enter, indiscriminately and with no criticism, the ordinary televisual flow. The evidence that the documentary record is manipulated produces an alienating effect, in Brecht's sense of the term, i.e. it results in a critical distance. That distance is also exercised by Roger Atasi in Hola y Chau (2001), with a good dose of humor. On other occasions, that distance can be temporal, poetic, even evocative. In Casa (2000), Jose-Carlos Martinat explores home space through an intervention in his family house with the images of his parents and ancestors. Using different means and expository devices, Martinat revives the abandoned place and gives it a body, a spirit, sensitivity and history. This way, spaces appear as inhabited by different realities, traversed by a past dialoguing with a present in which the thickness of time is updated. Few spaces are as eloquent as those used by the artist. It is always necessary to conjure one's ghosts. Technology acts, in this case, not a means but as a medium, a meeting channel with the otherworldliness which, in fact, is a thisworldliness, a voice that resounds in the comers of our memory, the weak though persistent echo of a sensitivity reluctant to disappear. If we extended the metaphor we would have to say that Philippe Gruenberg and Pablo Hare are the exorcists of the city of Lima. Their photographs conjugate different strata that share the daily happenings of town: the thriving city and the decadent one, the public space and the private one, the city one lives in and the emblematic one, a past filled with utopias and the present. In making their images the artists have transformed paradigmatic Lima buildings in temporary pinhole cameras, recording the projections of the reversed city on its internal walls. In an excellent essay on this series of works, Rodrigo Quijano characterizes their works as "...the history of a decline. The decline of Lima city or, if wanted, the vanishing of a simulacrum, of a kind lie locked in an urban space whose coordinates supposedly had as a goal the organization of certain society, an organized ideal society" and he adds, "the buildings drilled by the photographic work of Gruenberg and Hare were built in the postwar and belong to that horizon of relative commercial prosperity that, after some earthquakes, also transformed the historical colonial landscape of the city...buildings that today stand as empty signs of a modem urban horizon which was never consolidated" (7). The political dimension of the photographs is undeniable and surely this is greater in the Peruvian context. But we would be unfair with the artists if we did not signal the beauty of their images, the subtlety of their juxtapositions and the keen approach to their city, which reminds us of classical film images such as Berlín, Sinfonía de una Gran Ciudad by Walther Ruttmann or El Hombre de la Camara by Dziga Vertov. May be the cinematographic references are not excessive. There is in the images by Gruenberg and Hare a delicate narrative dimension, the exercise of a sort of urban chronicle that situates them as perspicacious observers of their own time. The preparation of the photographic records i.e. the meticulous control of the recorded situation or its open mise en scene has created much writing produced on the authenticity of the takings and their deviate relation with the reality presented. Contemporary art, however, has produced enough evidence on the possibility of materializing true moments even through framed situations. In the photographs of the series La Otra (2002), Natalia Iguíñiz portrays a group of maids and their lady employers in the home where their contractual relationship is established. Their postures denote the strain of the situation, that dangerous approximation of two people who are separated not only by an economic transaction or a difference in power but also by the (more than frequent) social and ethnic differences. Thus, the portraits are the staging of a latent tension rather than a record of a domestic circumstance, and a home is no longer the idyllic place where the life of people goes by but a staged privileged for the biopower. The portraits speak by themselves. However, Iguiñiz does not give in to coarse confrontation or hotheaded antagonism. The serenity of the postures and the poor expression of countenances promote a calm reading out of which the conflicts are sure to appear from underground. In some cases, though, it is difficult to tell the difference between the employer and the landlady; this leads us to a closer consideration of details like their clothing, the sprucing up or their posture. Recent videos by Diego Lama also resort to a careful staging and to built-up situations. But in his case these elements purport conflicts of a symbolic concern. The excessive care for the formal reveals the artificiality of the actions, but only to project them from the visual representation to the semantic field. With an aestheticism which is both dispossessed and ascetic, Lama bases his works on the concentration of reading keys which update through basic stage conflicts. Symmetry, rhythm, counterpoint, contrast and repetition turn the images into a visual symphony that, in combination an omnipresent soundtrack, gives an operatic air to the whole team. The influences from this music genre seem not to be too far. Theatrical characterization serves Juan Pablo Murrugarra to stage a multiplicity of assumed, demanded or wished for roles. In this sense his series Wannabe (1999) is almost a tragicomedy that revolves on the construction of individual identities in the social context. These appear as a result of permanent negotiations and pressures. This interweaving of the individual and the social, this personal position in reference to the social and cultural entourage that is shaping the new century, permeates with its stories, sketches and sorrows the photographic and electronic contemporary production of Peru. Each artist's proposal serves to question topics and crush stereotypes. Yet what is never lost is the power art still possess: that of building a cultural identity -even if this is perceived as partial, unfinished or fragmentary. Vía Satélite (cat). Buenos Aires: Fundación Telefónica, 2005. (1) See the description of this piece in the catalogue. (2) Foster, Hal, "The Artist as Ethnographer", in Foster, Hal. The Return of the Rea/. Cambridge: The MIT Press. 1996. (3) Habermas, Jürgen. The Structural Transformation of the Public Sphere. An Inquiry into a Category of Bourgeois Society. Cambridge: The MIT Press, 1991. (4) To further this topic, see: Pultz, John. The Body and the Lens. Harry Abrahams, New York, 1995. (5) Wall, Jeff, "Marks of Indifference: Aspects of Photography in, or as, Conceptual Art", in Reconsidering the Object of Art 1965-1975. Los Angeles; Cambridge: The Museum of Contemporary Art; The MIT Press, 1995. (7) Quijano, Rodrigo, "La Ciudad: El Camello por el Ojo de la Aguja", in Lima 01 (exhibition catalogue), Lima: Ediciones Galería del Escusado, 2002. * Translator's Note: "chumpi" is a Quechuan word for "belts"; in the Shamanic tradition each belt has a different energy. ** "Oh, halt thee, Prince of the Scissors, for thou have forgotten thy robe at the cascades. The harp with an eye towards the star, as a falcon, leaning out, bids thee farewell. The violin plays its bow on the moon and the chumpi which holds the harp up in the sky throws ten thousand stars at a shot. The scissors go to sleep and there's a resonance of those dreams that resound in the daylight".